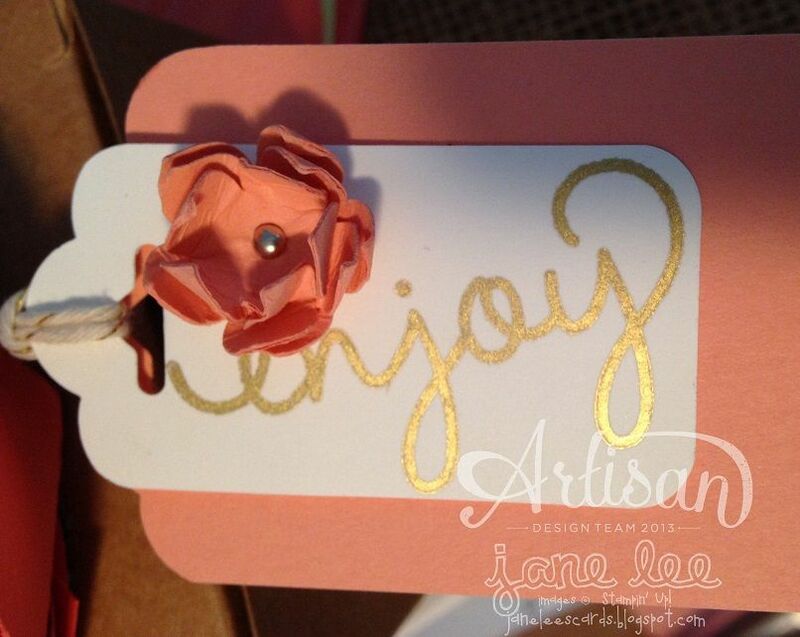 Welcome to the 2014 *March* edition of the Wednesday Artisan Blog Hop. 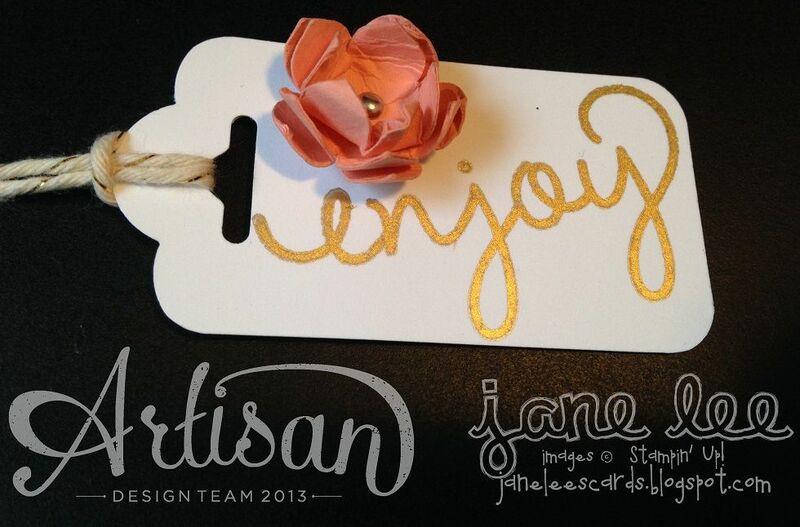 Check back every Wednesday to see new projects that all 10 of the Stampin' Up! Artisans have created. Most of the items on this project are from the Mini Catalog? Lurve!! If you follow my blog you will probably notice that most of my projects have banners, grunge, crumpled paper, distressed ink, etc. Every once in a while I'll throw in a project with clean lines but that's just like a palette cleanser for me. You know? How often do you see me create projects with flowers? Sometimes I forget how to be girly. Sometimes I forget that I can make things pretty. 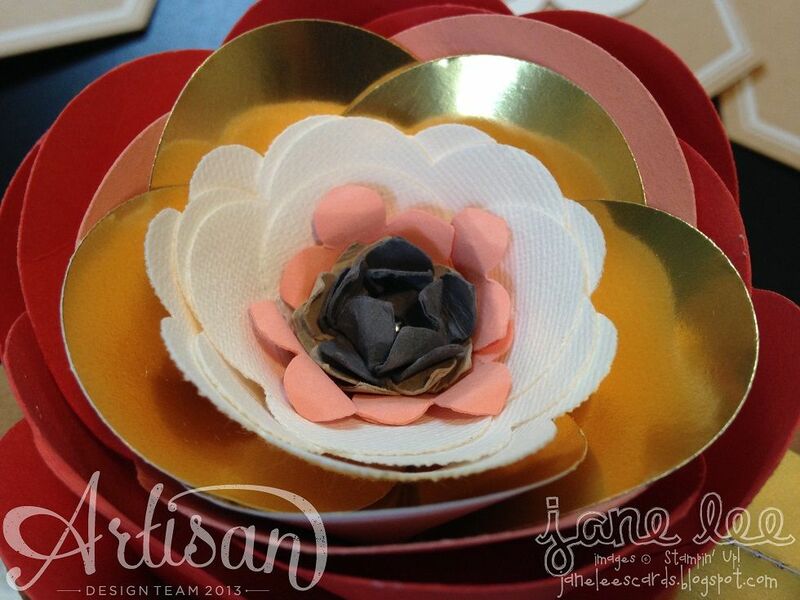 When I got the March Artisan Box, 90% of it was flower stamps, flower punches, floral paper, flowers, flowers, FLOWERS. I'll just admit that I thought,"Wow. Ugh. Flowerzzzzz. Flerppp." Ok, but then I used the Spiral Flower die with the Canvas Creations sheet and something magical happened and this box pretty much created itself. What the crazy??!! I made this project and have fallen in love with flowers. So prepare for a month of projects mostly related to flowers or floral something. Are you wondering how I made my rad tag? Are you pickin' up what I'm puttin' down? I just trimmed the scallop tag punch. See?? Eh?? See?? 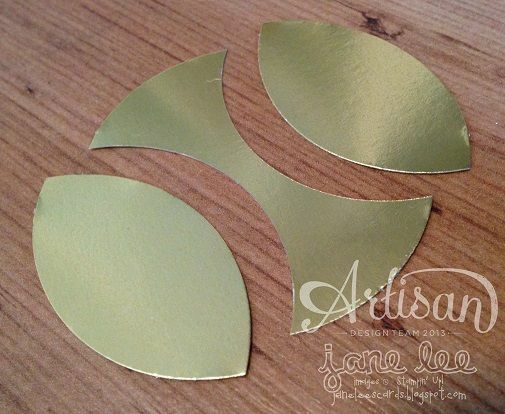 Nice little leaves made with the circle punch. Ta da! 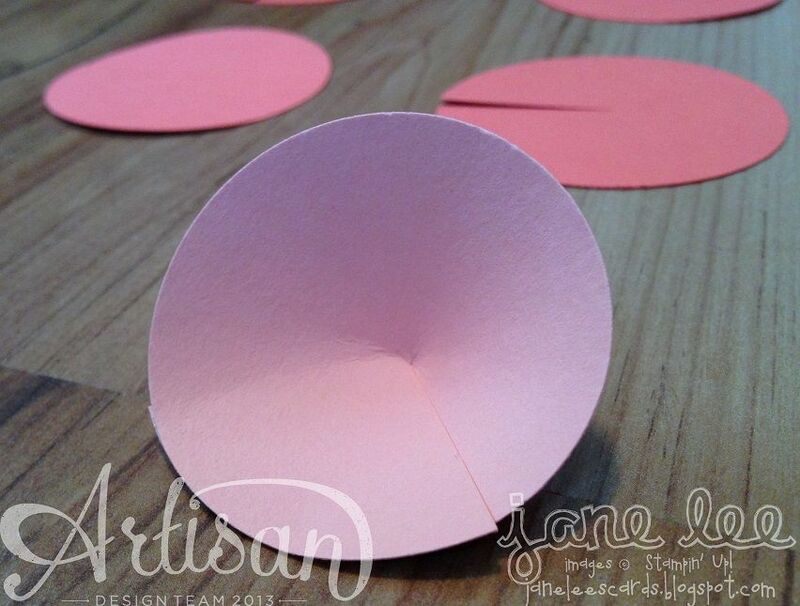 To make the petals of your blossom, cut a line to the center of your circle and then make a little cone with your circle. The taller your cone, the taller your blossom. Try all different heights until you find the one you like. 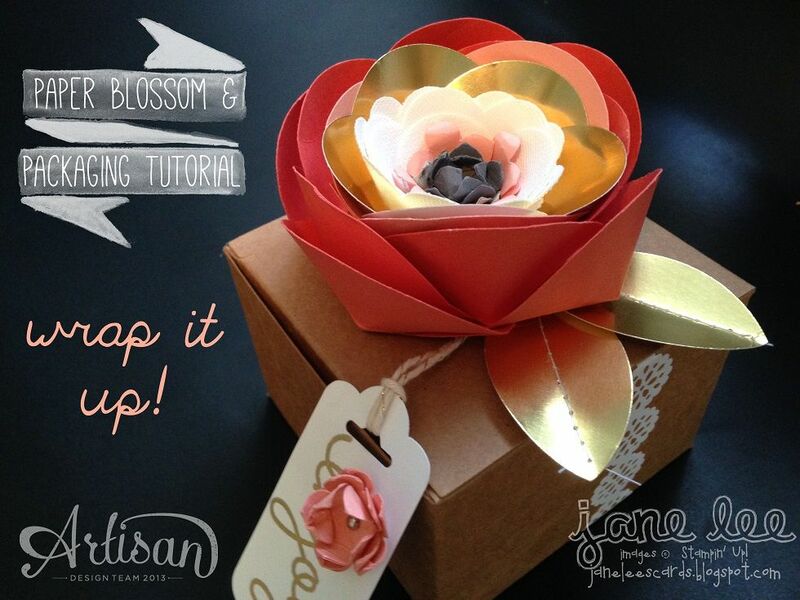 Start assembling your blossom in a circular pattern (with hot glue, of course). Keep adding circles until you are satisfied with the size of your blossom. 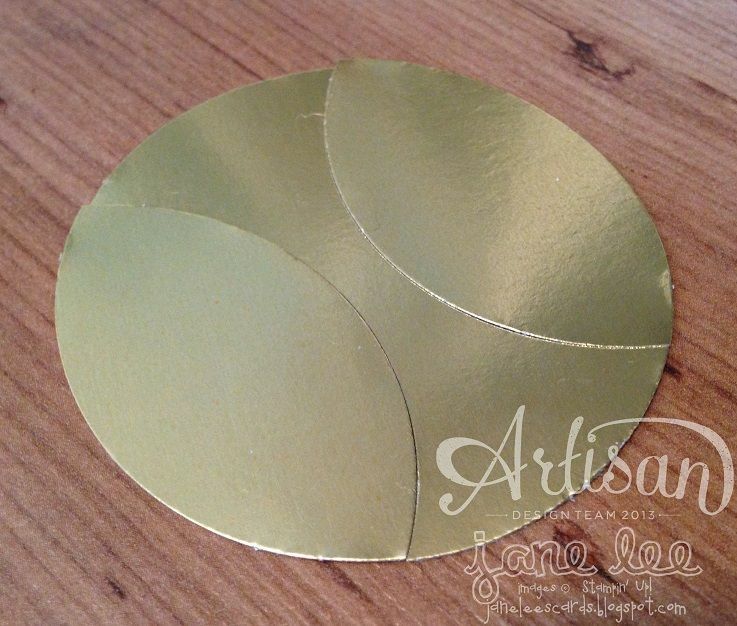 I have smaller punched circles in the center than I do on the outer edges. In person this gift is adorable, fancy, swanky, sweet, pretty, lovely, and chic. Ok, can you tell I love it? I just feel happy every time I look at it. I look at it a lot. It's SO not me and yet I still feel like it's SO me. MEEE-yow!! Wowza! I love it!! A definite show piece! This is so FREAKING CA-YUTE girl! Love it!!!! Love it!!!! Love it!!! I am pickin' up what you are puttin; down. Yes, I am! so many fun things to try! Way to go Jane! Stunning! 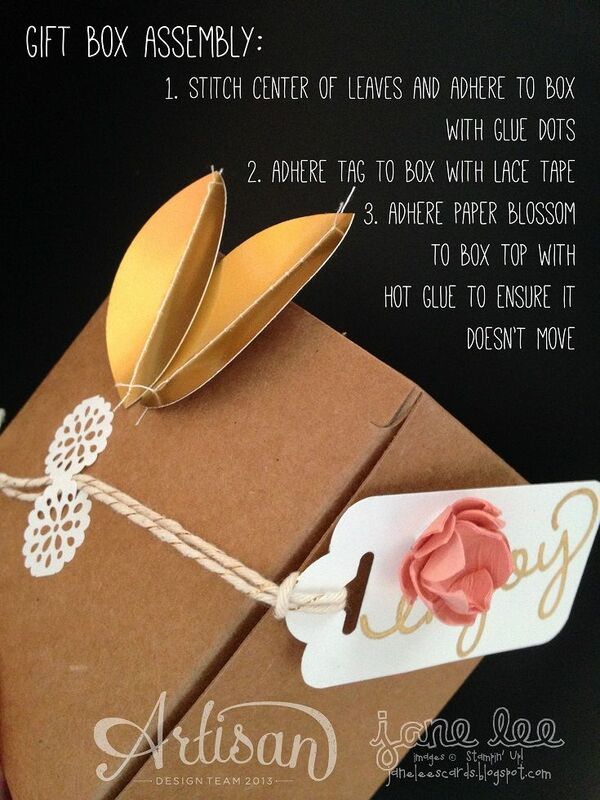 No need to put anything inside the box - it IS the gift! FABULOUS!!!!!!! Gorgeous, beautiful, wonderful, amazing....does that work? For a gal who says she is not girly, you certainly turned out a VERY girly flower! 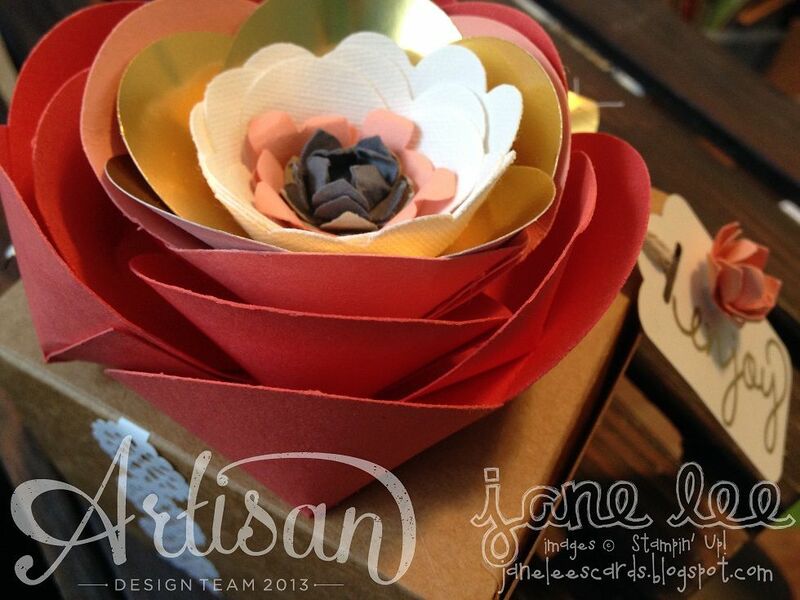 Jane...you are a crazy closet flower freak! Ha Ha Ha! I LOVE IT! It is so FANCY! Jane, this is amazing and YOU are amazing. I love everything about this! All of your attention to detail is just stunning. Love it! Another beautiful project! Jane, I am sending you a whole bunch of hugs!!!! I'd been sorry to have sold one of the flower punches, because it made excellent leaves. 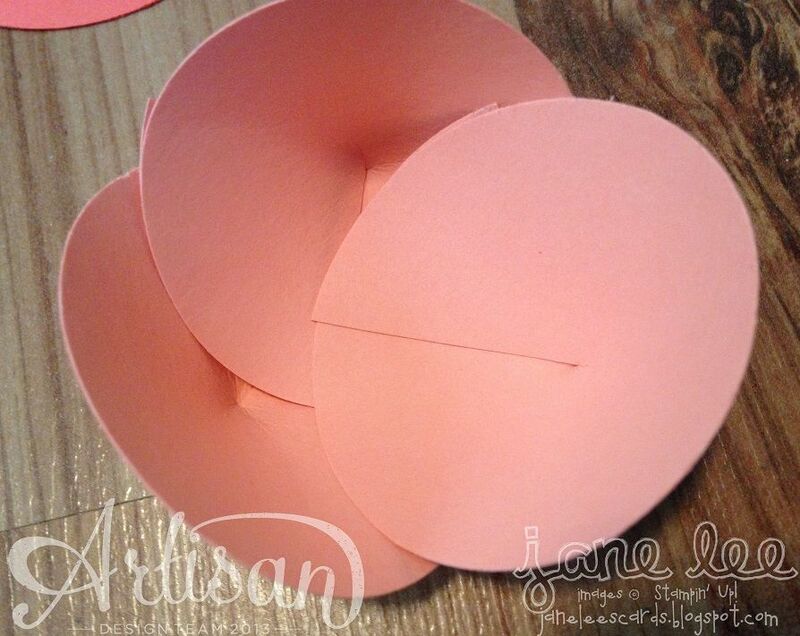 Thanks for your GREAT idea, using the circle punch - a whole avenue of possibilities just opened up!